ALI MOORE, PRESENTER: American writer and often controversial commentator Daniel Pipes is president of the Middle East Forum and is visiting fellow of the Hoover institution of Stanford University. He's currently in Australia as a guest of the Australia/Israel & Jewish Affairs Council. He joined me from our Brisbane studio a short time ago. Daniel Pipes, welcome to Lateline. DANIEL PIPES, MIDDLE EAST COMMENTATOR: Thank you. ALI MOORE: If we can go straight to those overnight attacks in Israel. Hamas denies involvement but Israel has already carried out airstrikes over the Gaza strip, Hamas has vowed revenge. Are we now looking at a potential major military escalation between Hamas and Israel? DANIEL PIPES: Indeed. And it has further complications because for the first time in many years the Sinai Peninsula, which is next to Israel, seems to be anarchic. And it appears the Egyptian government is not fully controlling it. And so this could be the first of many attacks, perhaps from Gaza, perhaps from Sinai itself, perhaps from Hamas, perhaps from other groups. So there is potential for much more trouble here. ALI MOORE: Well indeed, Israeli prime minister Benjamin Netanyahu says Israeli sovereignty was harmed and he said Israel will respond accordingly; what does this mean for relations with Egypt? DANIEL PIPES: Well Egypt is in transition now. Hosni Mubarak, who ruled the country for 30 years, was deposed in February by other military leaders. And it's now another military leader, by the name of Tantawi, who's in effect running the country. We don't know all that much about Tantawi, he's only been in power for half a year, does he really want some major change with Israel or not? I tend to doubt it. Does he not want to control the Sinai Peninsula? I think he does. So I'm inclined to see more continuity than change. But this certainly is a change and we will see how important it is. I worry that this could suggest that the Egyptians are not really willing to put in what it takes to control their own territory. ALI MOORE: And, of course, Egypt has been crucial to Israel's security for what, three, four decades? DANIEL PIPES: There was a peace treaty in 1979 between Israel and Egypt, correct. ALI MOORE: So what happens now do you think? DANIEL PIPES: Well as I say, Egypt's in transition and we the world and the Egyptians, are still finding out what exactly is happening in Egypt. As I suggested earlier, I think there's more continuity than change. I think there's likely to be crackdown eventually by the Egyptians, but in the meantime it could be a source of significant problems, a source of warfare. I wouldn't call what happened now terrorism, it was more a military assault. It was a pitched gun battle, it was explosives, it was an attack. This is something rather new, so we're feeling our way in a new direction. ALI MOORE: And we've seen Israel respond obviously in the Gaza Strip. But more broadly, how do they respond to this situation along this very long border in the Sinai Desert? I mean essentially they're being forced to respond to the aftermath or the fallout from the Arab Spring? DANIEL PIPES: Well what they're doing is building a security fence, as they have in the West Bank. It's not completed, but this incident has spurred them to move up the completion date to the end of 2012, roughly a little bit over a year from now. It's wild, there's no real security there. And for years the Bedouin, the nomads of the Sinai, have been crossing between Egypt and Israel with impunity; smuggling, bringing in refugees from Africa. This was an incident waiting to happen and now Israelis are taking steps to prevent it from happening in the future. But there's still over a year of vulnerability before that fence is finished. ALI MOORE: Well let's turn to Syria. How significant is president Obama's call for the Syrian president, Assad, to go; along of course with the leaders of the UK and France and Germany? DANIEL PIPES: I think it is significant. I think the fact that the leaders of these four countries, plus the Saudi leader and a number of other Arab leaders, have come out and criticised the Syrian government, and now gone the extra step of calling for the removal of Bashar al-Assad, gives the Syrian population more hope, more expectation they can have help from the outside world. It's a serious step. It's not exactly the same as helping them directly with arms or money or other benefits. But it is a serious sign of solidarity with the opposition in Syria. They are not alone. ALI MOORE: Would you ever expect them to take that extra step, because it has to be said that President Assad has remained relatively resilient to outside pressure, and indeed is now saying that the military and police operations are over? DANIEL PIPES: I can imagine, yes, that the outside world, the great powers, the Western powers, will give aid to the Syrian opposition. Now it's a little difficult, because there's not an organisation. But I can imagine sending them money, arms, perhaps through Lebanon, perhaps through Turkey. It could happen, perhaps through Iraq, perhaps through Jordan. It's not inconceivable as this confrontation between the population and the government goes on month after month and it gets uglier and uglier. Yes, President Bashar al-Assad has said that the operations are over, but he said a lot of things over the last half year that turned out not to be true. I would tend to not expect this one to be accurate either. ALI MOORE: Would there really be appetite though, I suppose, to get involved to that extent? Of course the US has taken until now to even make this call for Assad to go, it's been extremely hesitant to jump in. And of course everyone is well aware of the situation in Libya, which has gone for months and months when there was original talk of weeks and weeks? DANIEL PIPES: Absolutely. The situation in Libya has turned out quite different from the expectations. There have by now, it's worth noting, been 17,000 military sorties in Libya. Now I can't see anything like that happening in Syria, but I can see more than what we've seen so far. And it's worth noting that, from the Western point of view, the real strategic importance of Syria is not what's happening in Syria itself, but the fact that the Syrian government has been aligned, allied even, with the Iranian government for 30 years. The Iranian government is our main problem. Were the Syrian government to change hands, were the Assad regime to fall, then this would deal a significant blow to the Iranians, which is really the most important thing from our vantage point. So there's a lot at stake in Syria at this time. ALI MOORE: That said, doesn't it depend entirely on what follows, what a post-Assad regime or a post-Assad Syria would look like? We've just talked about what's happening in Egypt, and it's a country in transition, how certain can you be of what would follow president Assad? DANIEL PIPES: I'm not at all certain. It could be something more liberal and it could be something more Islamist. And I think part of what I hope the West will do is to help the liberal forces. But even if it were Islamist I believe, with some certainty, that there would be a break in relations with the Islamic republic of Iran. And that to me is of great importance. So I would rather have the devil I don't know than the devil I do know in the case of Syria. In Libya I'm more cautious. ALI MOORE: I was going to say though, in Syria is there also a risk sectarian civil war though? DANIEL PIPES: There is indeed. The big question in Syria is whether there will be a sense that the Syrian people as a whole have risen up against their autocratic, brutal government; or whether this is ultimately a fight between the Sunni majority and the Alawite minority that has been ruling in Syria for four decades. That's an open question at this time and it's dangerous, no question. ALI MOORE: And in Libya, you said you're more cautious? DANIEL PIPES: In Libya more cautious, despite the fact that my government, the US government and others, have been trying to get rid of Gaddafi in effect for months now. I'm not so quick to want him out. I have nothing good to say about Gaddafi, he's a wretched, maniacal leader who's done terrible injury to the country. But he is an isolated leader, whereas were the Islamists to take over, the people who want to apply Islamic law, and that's who might be really finally ultimately in charge in Benghazi, I worry they'll be connected to the larger Islamist movement across the Middle East and the globe. And they could be even more dangerous than Gaddafi. And so I'm not so eager to have Gaddafi leave, until I know more about who's there in Benghazi. ALI MOORE: That said though, that ball is already well and truly rolling, isn't it? DANIEL PIPES: It is, indeed. And the fall of Zawiya just now and other developments suggest that there could be a collapse of the Gaddafi government in Tripoli. It does look more likely than not at this point. I'm worried about it. ALI MOORE: You say that you're concerned about what would take over, but as you also say, your government and many other governments have now recognised the rebels as the legitimate governing forces in Libya. What is the seed of your concern? DANIEL PIPES: Well, it's a very strange thing. We've gone to support the rebels and we've recognised the rebels and we don't know who they are. We don't know who we're backing. This is not a very smart policy. Isn't it better first to know who you're working with before you support them? It was done in a fit of emotion and worry and here we are. So I think it was one of the less cautious efforts by NATO (North Atlantic Treaty Organisation) or Western powers. ALI MOORE: Who do you think they're working with? DANIEL PIPES: I fear that these are ultimately Islamists who will take control. ALI MOORE: On what grounds? DANIEL PIPES: There's plenty of indication to suggest that the Islamists have an important role in the rebel forces, that they're being cautious about showing their face, but that when they succeed and Gaddafi's gone, they will then emerge as the power behind the rebels. And the more friendly faces will be pushed to the side and the Islamists will be in charge of Libya. This is not a good development. I would rather have Gaddafi there than the Islamists. I think he is more isolated and in the end less dangerous than the Islamists would be. ALI MOORE: ... although it is taking a lot longer than everyone said. 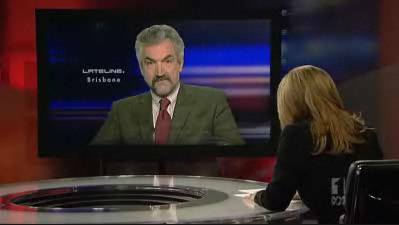 Daniel Pipes, many thanks for talking to Lateline tonight.